A and B together can do a piece of work in 15 days. A alone started the work and worked 14 days for days and B finishes the remaining work in 16 days. How long B will take to complete the entire work? Amrish is 100% more efficient than Baghvan and together they finish a piece of work in 180 days. In how many days will Sekar alone finish the work if efficiency of Sekar and Baghvan is in the ratio 3:1? Amrish and Baghvan together take 30 days to complete the work. Baghvan take 540 days to complete the work. A glass kettle is marked up by 75% and 25% discount is offered for the first 50 customers. The cost price is Rs 16. What is the difference amount gained by 30th customer compared to 52nd customer? What is the area (in sq cm) of a circle whose radius is equal to the breadth of the rectangle if diagonal of rectangle is 25 cm and length is 24 cm? A student scored 120 marks in the 5th internal test. Average marks of the student increases by 5 for every test. What will be his average after the 5th test? What is the sum of the first 11 terms of an arithmetic progression if the second term is 15 and the 7th term is 5? −ax + 21y = 21 has slope of 4/7. What is the value of a? What is the value of sec 45° - (1/√3) tan 60°? 1) A and B together can do a piece of work in 15 days. A alone started the work and worked 14 days for days and B finishes the remaining work in 16 days. How long B will take to complete the entire work? 2) Amrish is 100% more efficient than Baghvan and together they finish a piece of work in 180 days. In how many days will Sekar alone finish the work if efficiency of Sekar and Baghvan is in the ratio 3:1? 3) A glass kettle is marked up by 75% and 25% discount is offered for the first 50 customers. The cost price is Rs 16. What is the difference amount gained by 30th customer compared to 52nd customer? 4) What is the area (in sq cm) of a circle whose radius is equal to the breadth of the rectangle if diagonal of rectangle is 25 cm and length is 24 cm? 6) A student scored 120 marks in the 5th internal test. Average marks of the student increases by 5 for every test. What will be his average after the 5th test? 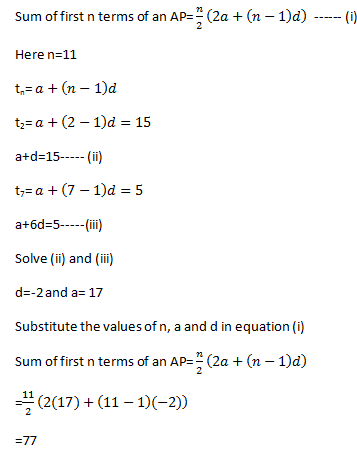 8) What is the sum of the first 11 terms of an arithmetic progression if the second term is 15 and the 7th term is 5? 9) −ax + 21y = 21 has slope of 4/7. What is the value of a? 10) What is the value of sec 45° – (1/√3) tan 60°?